made me roll on the floor in laughter! this anime is great in my opinion, its animations style is awesome and they even bring some japanese folktales up and famous art like Katsushika Hokusai's The Great Wave off Kanagawa. they also always manage to bring a ton of humor! "i cant see one episode and not laugh!" also This anime feels so original and it is so refreshing ! i can only say: get the your poki ready and enjoy hozuki no reitetsu. this anime will 4 ever be my favorite! 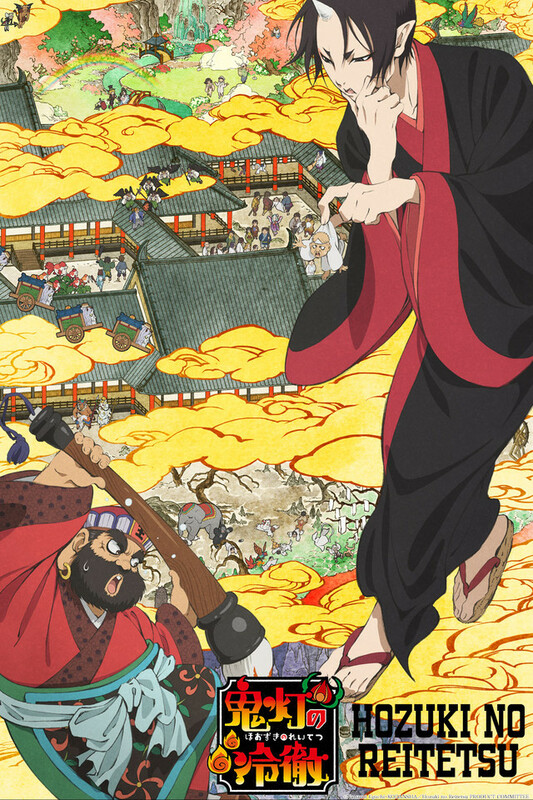 Hozuki no Reitetsu Super Recommended! Hozuki is ruthless in keeping Hell running like a lava flow. The look at Japanese mythology vrs western culture and how it plays out in hell is excellent. And wait until you see Hozuki drunk. Easy going episodic approach. Interesting cast of characters that are based in Japanese folklore. Hozuki character’s dry humor sells it, his character is nice of blend of the evil person a chief of staff of hell would be, with a touch of nice. Ahhh...this anime is the kind when you start you never want to stop it. i was really saving chapters to not end it soon. it's really cool how this anime compare the oriental and occidental inferno. And you realize that inferno is not a bad place at all. of course, if you are a demon, if you are a sinner, i can't tell it at all. See it, you satisfaction will be granted . If not for anything else, I love this series for the song from 8th part/period. Definitely a good entertaining watch! I really loved this anime! It was funny and entertaining and had a great flow to it! I feel like there could have been so much more of this anime and I would have just continued to watch the exploits in hell to see how things continued along. Especially between japan hell and western hell. Satan was hilarious. This show is odd, very odd at times, and somehow that made it feel... sincere. Authentic. The writing often feels like a form of mythology satire, but aimed inward, and results in a work that is at once shockingly funny and elucidating. Very glad to have stumbled across this anime. This is such a fun and hilarious series! There is varied mix of historical and pop references in both the stunning art style and clever dialogue. Distinctive characters who you cant help but love despite being demons who brutally torture sinful human souls. Hozuki, the main character and right-hand Oni for the King of Japanese Hell, is by far my favorite character, and I was never disappointed with his actions. This show is just, so great, and I'd recommend it to anyone who has a soft spot for morbid humor interspersed with goofiness. As a bonus, the OP song is super catchy. A warning though, the characters are true demons who brutally torture others, and although I never found it too be too much, there is a distinctive amount of gore and violence in the background as Hozuki goes on inspections around Hell. In other words, if you're squeamish around gore or themes of brutality then you probably wont enjoy this series as much. My favourite anime! It's an unique comedy filled with sarcasm, bad humour and on top of that, it's super random. I would definitely recommend this to anyone who has watched too many typical anime plots. The characters are funny, unique and are well drawn. I like the art in general, especially since there is a hint of the traditional Japanese drawing style. Otherwise the music is brilliant, fx the opening song is something one would not expect. Even after rewatching it several times, I don't get tired of this anime!